The Health Resources and Services Administration awarded a $600,000 grant to the Arkansas Rural Health Partnership (ARHP) for the creation of the ARHP-Outreach Program (ARHP-OP). The three-year project will expand health care service delivery by increasing prevention, education, and access to mental and behavioral health services to residents of Drew County and other rural communities served by Drew Memorial Health System (DMHS) and its health care clinics. Although mental and behavioral health have long been a major concern across the nation, rural communities are particularly vulnerable due to extremely limited access to mental health professionals and treatment. 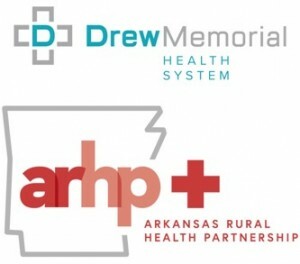 The program expects to reduce morbidity and mortality due to mental or behavioral health conditions in adults (age 18-64) by 15% in rural southeast Arkansas Delta by April 2021. To meet this goal, mental health assessments will be provided by DMHS for all ten ARHP partnering Emergency Departments (EDs). These include DMHS as well as Ashley County Medical Center in Crossett, Baptist Health Medi- cal Center in Stuttgart, Bradley County Medical Center in Warren, Chicot Memorial Medical Center in Lake Village, Dallas County Medical Center in Fordyce, Delta Memorial Hospital in Dumas, DeWitt Hospital & Nursing Home, Jefferson Regional Medical Center in Pine Bluff and McGehee Hospital. The ARHP-OP will make available 24-hour access to telemedicine counseling provided by a mental health professional to all partnering EDs. Services will include patient assessments and referrals to treatment, and also increase the ability of rural emergency departments and hospitals to provide relevant and timely mental health assistance within the local community and throughout ARHP’s 19-county service area. The ARHP-Outreach Program will also provide front line responders with Mental Health First Aid (MHFA) training. MHFA is an early intervention program successful in improving behavioral health in rural communities. By address- ing the immediate need to equip these front line workers—EMS/EMTs, EDs, hospital and clinic staff and law enforce- ment—in how to recognize the signs and symptoms of an individual in a mental health crisis, they will be better pre- pared to offer early intervention and assist individuals in need of treatment. “By providing the appropriate training to Drew County healthcare workers and front line responders as well as mental health resources to help our hospitals with quick response for these patients in our emergency departments, our local hospitals can build more resources to provide quality care,” Bridewell stated. This entry was posted on Tuesday, April 24th, 2018 at 9:38 am	and is filed under Medical / Hospital. You can follow any responses to this entry through the RSS 2.0 feed. You can leave a response, or trackback from your own site.